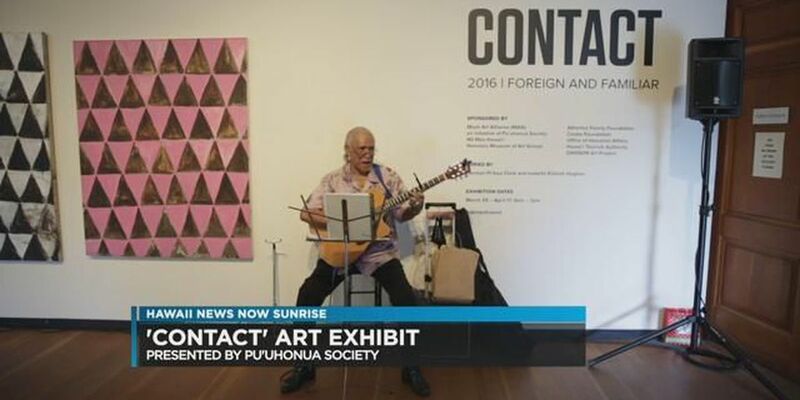 HONOLULU (HawaiiNewsNow) - Pu?uhonua Society presents the fourth-annual CONTACT exhibit on April 1–16, 2017, at the Honolulu Museum of Art School, featuring contemporary artwork that explores Hawai?i in a Thousand Years. Now in its fourth year, CONTACT is the most comprehensive annual exhibition of contemporary art in Hawai'i. For this year's exhibit, the Hawai?i-based art collective PARADISE COVE commissioned 10 new artworks and curated 13 additional works by artists in Hawai'i. The collective will also jury in dozens of additional works of art to round out the two-week show. Every year, we encourage artists to create work around the idea of contact in relation to the Hawaiian Islands and the people here," says Josh Tengan, CONTACT exhibition manager. " CONTACT 3017 encourages artists to contemplate the future of Hawai'i. Artists will take on the role of futurologists, forecasting Hawai?i in a thousand years, based on what they know now. The artwork in CONTACT 3017 is sure to transport us to possible and absurd futures of Hawai'i, as well as provide a strong critique of local culture today." CONTACT 3017 comes at a time when the buzz around contemporary art in Hawai'i and the Pacific is particularly strong. From the recently launched Honolulu Biennial 2017 (which will run concurrently with CONTACT 3017) to the recently completed POW!WOW! Hawaii (featuring muralists from Hawai'i and around the world), seeing art now tops most to-do lists in Hawai'i. "Contemporary art is gaining traction on O'ahu," says Maile Meyer, of Pu'uhonua Society. "Take a look at Ward Avenue, you've got the inaugural Honolulu Biennial at The HUB, Aupuni Place, a professional art studio and gallery space at ward warehouse, a mile-long mural installation around Thomas Square by CONTACT artist Solomon Enos developed in partnership with Mayor's Office of Culture and the Arts, and the CONTACT 3017 exhibition opening at Honolulu Museum of Art school, it's the beginning of an "art corridor" experience in urban Honolulu — public, private, and not-for-profit creative collaborations, we can only do this together." For more information, visit www.contacthawaii.com or on Instagram @contacthawaii.